And boy was I right. The meat was . . . interesting. Not good, but not the worst thing I’d eaten. I’m just going to say, if I’ve ever unknowingly eaten “dog” in my life, I think it was at that moment. Don’t get me wrong, I ate nearly the whole thing. But it was weird. That evening we went to the night market to peruse through the same stuff we’d seen at every other night market. 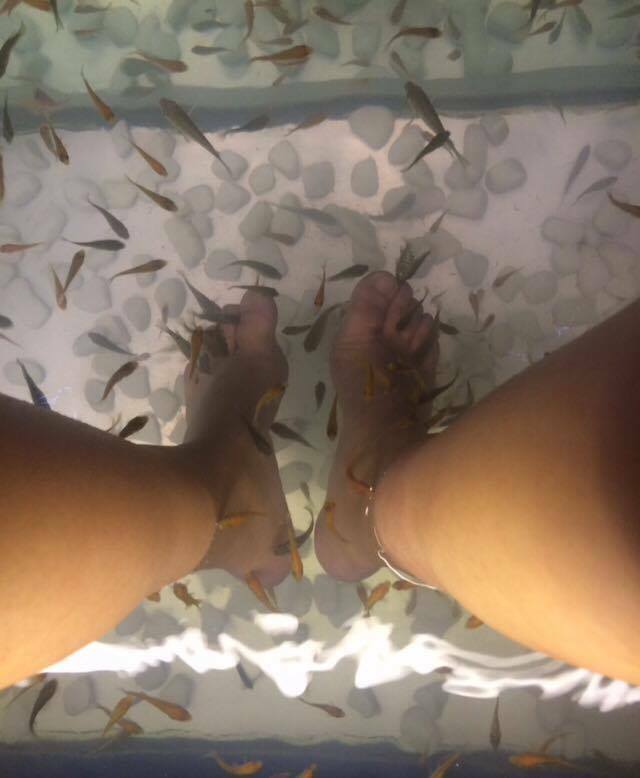 Eventually we stopped at a “fish spa” where two German girls hung their legs into a giant fish tank and had their toes nipped at by tiny fish. It was allegedly good for your feet because the fish eat the dead skin. I had heard about this in cosmetology school, but was told it was banned in the United States due to unsanitary conditions and possible risk of infection and spread of blood borne pathogens. I had to try it. Kaitlin joined me. We perched up on the wooden seat next to the German girls and swung our legs in. Oh my gosh. It tickled so badly, I had to keep taking my legs out. We moved to the tank with the larger fish (still no bigger than 3 inches long) and that one actually hurt a bit at times. Occasionally it would feel like little razor teeth were snagging your leg. One of them cut Kaitlin’s toe. We left. The next morning we called for our tuk tuk driver, Dobey, to take us around for the day. First stop, Angkor Wat, the largest religious monument in the world. We were all very excited to see the temple, but we were less enthusiastic about the weather. It was so unbelievably hot. And since we were entering a religious temple, we had to wear clothing that completely covered us. I chose to wear a sarong over my tank top to serve as a cover…a cover that I could occasionally attempt to fan myself with. The beginning of our tour started with the long stretch of unshaded walkway before the entrance. Our tour guide, while very nice, was very slow. You know that moment when you’re so hot that you can’t focus on anything else and you just get angry? That was me. I didn’t hear a word he said. I was melting. When we finally got inside, I was able to stay in the shaded areas as we walked around and heard all about how the temple slowly transformed from Hindu to Buddhist. It was a stunning encounter. Our tour guide even took us over to the water and posed us for these really nice photos. Good job tour guide! Towards the back of the temple there was a steep stairwell leading to a special tower. We had all thought that our sarongs would suffice as a religious cover, but the tower was extra sacred so the dress code was stricter than the rest of the temple. I was not allowed up since I only had a tank top underneath my sarong (even though my shoulders and back were fully covered by the sarong). Since Bri and Kaitlin had t-shirts on under their sarongs, they went up. 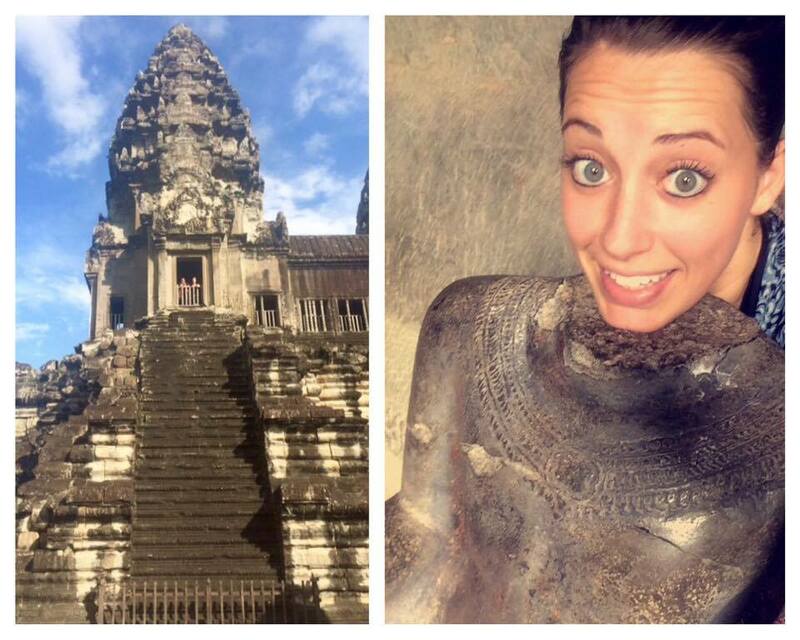 I walked around other parts of the temple by myself and took pictures of myself posing with headless statues. I think I got the better end of the deal. 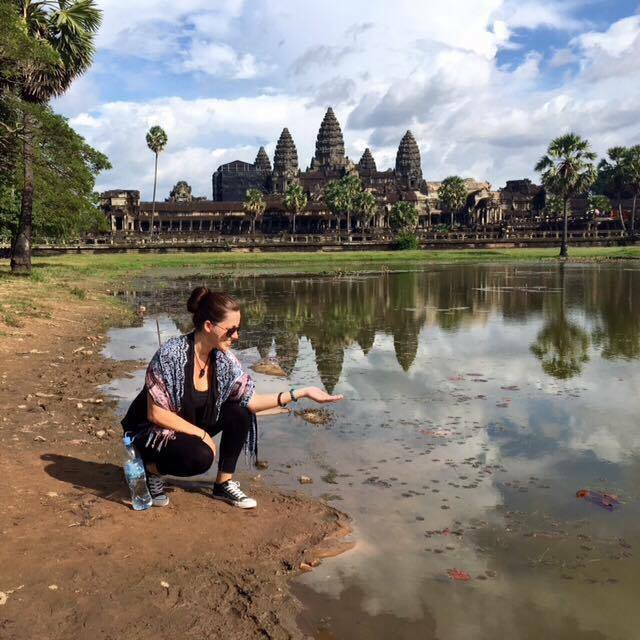 Next we went to Angkor Thom – the capital of the Khmer empire. It was equally as stunning as Angkor Wat, but in different ways. Since we were all tired from walking around Angkor Hot all day, we busted through Angkor Thom in about 30 minutes. Afterwards we saw a fruit shake stand. Woot! I had been craving a watermelon fruit shake all day. I went down to the stand and ordered one. “Yes, watermelon,” she replied as she began moving fruits around. Moments later I paid and was presented with a lime fruit shake. I sucked down the shake anyway and we were on our way to watch the sunset. The next day we packed our bags and tuk tuked to the bus station, next destination: Phnom Penh, Cambodia. We hadn’t eaten breakfast or lunch, so we searched near the bus station for a restaurant or street food. All we found was a food stand with some sort of soup and bone-in chicken scraps (mostly bone). There were flies everywhere. I looked farther down the street with no luck and eventually ended up back at the fly infested chicken hut with Bri and Kaitlin. If I’m going to get food poisoning on this trip, it will be from this food.